Tomato and Roasted Pepper Salad. Every Moroccan is familiar with this salad. Tomatoes are peeled, seeded, and chopped, and then tossed in a vinaigrette with roasted peppers. Other ingredients such as onions and parsley can be added if desired. In addition to being a popular side dish, tomato and roasted pepper salad makes a great filler for a sandwich, especially when paired with grilled meats. 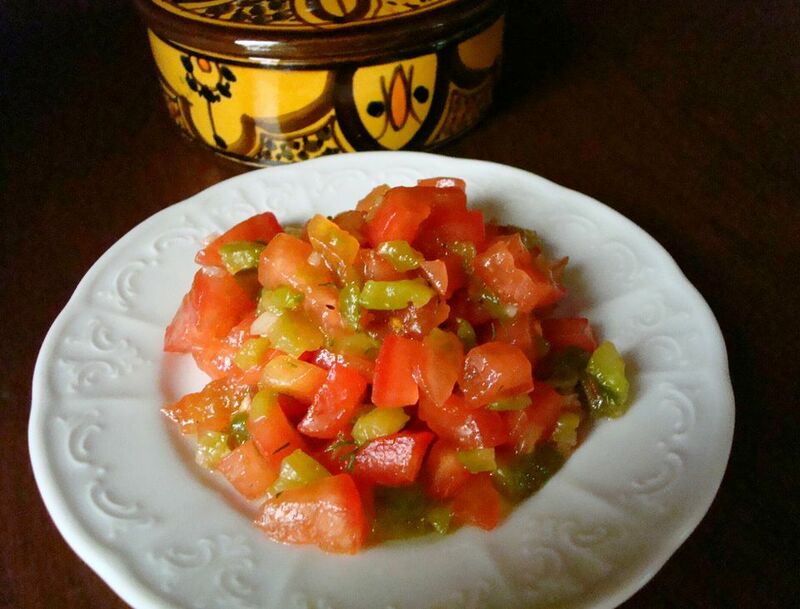 It is sometimes called Markat Hzina and can be used as the foundation of a Salade Marocaine. When you're ready to serve the salad, bring it to room temperature and add the salt, pepper, cumin, oil, and vinegar. Toss or stir gently and serve immediately on small plates or in small bowls. You can eat this salad with a spoon, but it's also delicious scooped up with a piece of crusty bread.